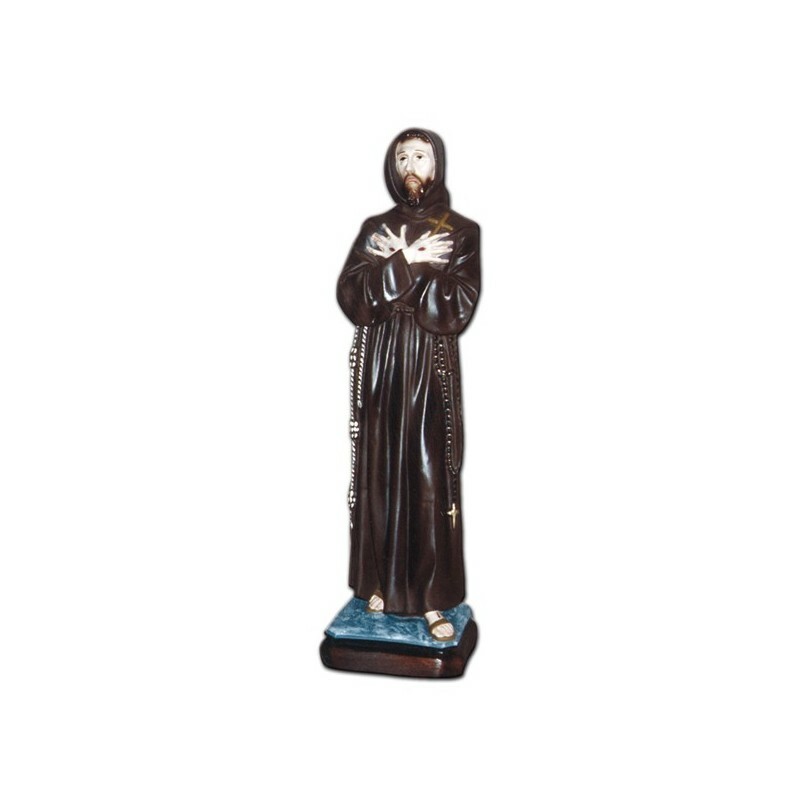 Statue of Saint Francis with cowl of 50 cm. St. Francis of Assisi was a foundator. He lived between 1181 and 1226. He is commemorated on the 4th of October. 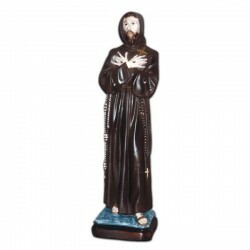 Saint Francis is certainly one of the most venerated saints and he is named “The poor of Assisi”. He was born in Assisi in a rich family, his father was a merchant. He lived his life in comfort, until in 1209, he decided to found the Order of Friars Minor, characterized from a joyful faith for the Christ’s adoration and from the observation of the vow to the poverty. The works tell us that in 1205, while he was praying in the Church of St. Damian, the Christ talked to him, asking him to repair the “his home” (the Church). The importance of that religious order, brought to the foundation of many convents. In 1219 there were 5000 friars. In the same year, Francis went to Palestine to try to evangelize the muslims, but he failed and he returned in Italy, where is order was in a complicated situation. Francis sent his disciples to the other countries, asking them to found some convents, near the Universities. His doctrine was approved by Pope Innocent III. On the 14 of September 1224, when he received the stigmas on the Monte della Verna, his life and his message had the approval of Christ. He wrote the “Praise of the Creatures” and for this work he was recognised as one of the initiators of the “italian literary translation”. The Tau (the last letter of the ebraic alphabet) is a symbol used from the Old Testament, which represents the safety and the love of God for the human beings. It is mentioned in the Book of the Prophet Ezekiel, when God sends an angel to imprint this symbol on the head of the servants of God. This emblem was adopted by the christians and Francis adopted it until he became the “living Tau”. The Tau is often acknowledged as the “Cross of Saint Francis”. The Saint conversed with the animals or “creatures”, as he called them. One of the most important events was the meeting with the wolf: one day, while he was walking in a village, he saw people who was scared. He asked the reason and they told him that a big wolf was killing animals and mens. Francis asked where this beast was and he began to look for it. When he found it he talked amorously to the wolf. He extended a hand and the animal submitted to him. Ever since the wolf never terrorised the people anymore. On the 18th of June 1933 he was proclaimed with Saint Catherine, the principal protector of Italy. He died in 1226 and he was canonized two years later. He is ilustrated with simple monastic clothes, while he is venerating the cross, with some birds or a wolf.